Bob Phillips is 76, married to Joyce 54 years. They have three children, five grandchildren and one great grandchild. 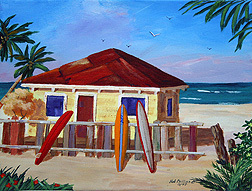 Currently his time is spent painting, surfing, enjoying his family, or just hanging out. For several months he was a combat infantry soldier in the Korean War, 1951. Purple Heart. Former ballplayer, racing yachtsman and golfer. 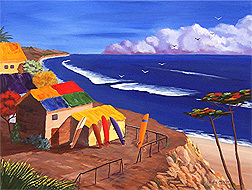 His art is driven by his love of the ocean and surfing. 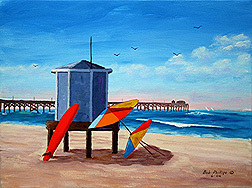 The images created are generally of surfboards, seascapes, piers, lifeguard towers, beaches, etc. 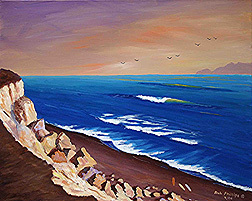 Size of the artwork is usually in the 12 by 16 to 18 by 24 inch range, and occasionally a larger piece is created. 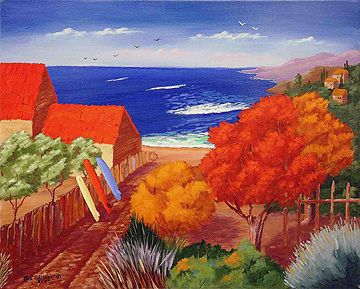 The work is done with the finest oil or acrylic painting materials and on high grade canvas. 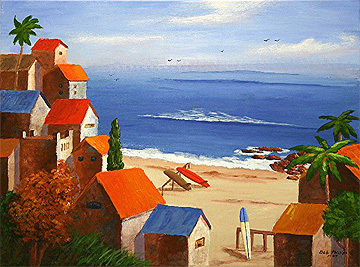 He has won awards at the Huntington Harbour Art Association shows, as well as the Huntington Beach Art Center. 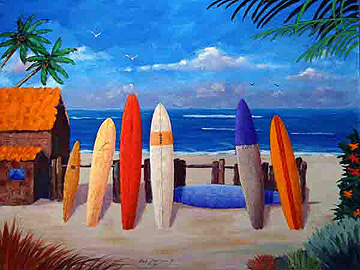 Original paintings and high quality reproductions are in hundreds of private and corporate collections throughout the USA, Mexico, Europe, the UK, Canada, Hawaii, and the South Pacific. Credit card purchases are available from the website. Great artwork, can't say enough about this artist. Smooth transactions and fast delivery.